I made that claim 5 years ago, and nevertheless authors continue to throw money away on book marketing strategies or author promotions that don't work. Then they get frustrated, because their $40 promotion only gets a handful of sales, and isn't enough to stand out from their nearest ten-thousand competitors. Some authors are spending thousands of dollars on advertising just to break even - and that's fine for them, but how can you afford to spend that much if your books aren't already earning money? I constantly hear authors ask for FREE and EASY book marketing tactics that work, but there aren't any. The truth is, you're going to need to spend some time or money promoting your books. But there are two big secrets that will allow you to get ahead. This includes writing a book that will satisfy readers in a popular market, and packaging it well enough to get them to pay for it. If this is your problem, my earlier course Guerrilla Publishing, or my free course on Writing Fiction That Sells, should help. This is the big secret to making money online. It's taken me a decade of work, but now that I know what I'm doing I can boost traffic easily with organic traffic from natural search results. Basically, yes. I know a lot of authors hate blogging, because they don't see any relationship towards writing new content and book sales; but that's because they're not writing content that attracts their target readers or building new traffic. Done right, you can grow a successful blog that attracts your target readers in under a year. 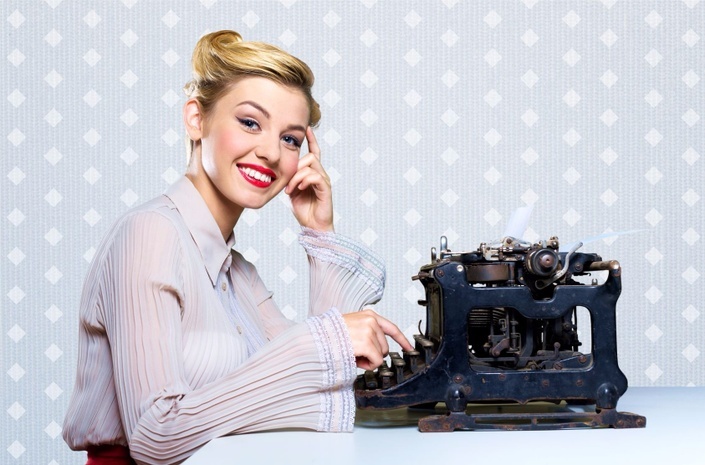 Right now, you probably need to pay for promotion or advertising to reach new readers. You're paying to access someone else's traffic or email list. The only long-term, FREE solution, is to bring all that traffic to you. What if you could get a 1000 visitors to your site a day, and convert those to 100 book sales. Now imagine if you could get 10,000 a day. I've been helping clients with this stuff for years, and even after laying out an exact, step-by-step plan for creating a funnel that attracts and converts readers on autopilot, most authors drag their feet at the blogging portion of it. They choose to go for "flash in the pan" marketing that sells a few books. Then, as their sales rank sinks into oblivion, they usually give up their dreams of becoming a writer or think their book just wasn't good enough to make it. and SO MANY other things. The problem is that most of this stuff takes months to build up, but authors are ready to publish right now and haven't thought about their author platform until it's too late. For far too many authors, the platform is something they decide to build after the book is ready, to generate more sales. So in this course, I'm only going to focus on powerful content marketing hacks that will take you from having no traffic or online presence, to having a powerful author empire that can launch bestselling books, in just 3 weeks. PREORDER SPECIAL - SAVE $400! In 2017 I realized that most authors aren't actually ready to commit to building a successful author platform, they just want to learn to launch and publisher a bestseller quickly. So I built Guerrilla Publishing. It's the most complete publishing and book marketing course to hit the market. If you're just publishing one or two books and don't actually want a stable, long-term career as a full-time writer, that's your best bet. Guerrilla Publishing covers all the stuff I used to get my books selling so I could earn a living as a writer. And though I know a lot more than I've shared so far, I don't like to teach things until I've actually done them. My new goals will be trying to hit the USA Today lists for both fiction and non-fiction, building my email list to 100K, and getting guest posts, podcast interviews and taking my platform to a much bigger level (which will make it easier to attract a traditional publishing deal). In other words, I want to go from "making a living" to "being a famous author." I'll share everything I've learned once I've got more to teach, and it'll be my best course yet. When it launches, it'll cost at least $749. But I'll tell you a secret. Since it's not finished yet, right now I'm offering as a bonus for students who join my Guerrilla Publishing program, which is only $349. So you're basically buying in at less than half price and getting an extra course for free. 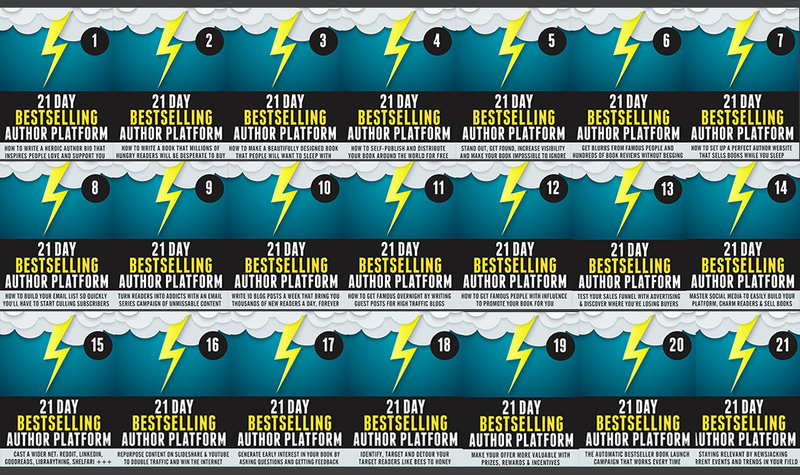 Build an author platform from scratch in under three weeks; and keep the sales coming in, month after month, with no advertising or marketing at all. Each day we will focus on only one major goal or topic, but it will be packed full of stuff you need to do. There will be lots of written guidance but also practical videos on how to actually do all the steps, so you can watch along and copy what I do. The full course will cost $749, because I only want serious authors who are committed to building a long-term author platform that can support a writing career. You'll be getting thousands of dollars in free templates, scripts, web and book design templates, promotional graphics and more; so you can easily build a professional looking author platform. I'll set up a private community just for our high-level course members, and be personally available to review your platform or answer any questions you might have. You'll also be able to get support, feedback and help - as well as develop cross promotional opportunities - with other authors in your genre. I understand some of this stuff is complicated and you may not want to set it all up yourself. I'll be including a handful of powerful done-for-you services, so I can just set things up quickly so you can get started without the learning curve. These are some of the same services I've been charging $5000 for. Everyone has the best intentions, but life can often get in the way. I don't want anybody to buy this course who isn't going to use it, so I'm going to build a 52-week email series to check in on you, give you weekly tasks, make sure you're following through and providing new marketing opportunities. Even if you get side-tracked for a month or two, I'll keep reminding you to finish what you started, so you can see actual results. To sweeten the deal, I'm going to be adding some exclusive interviews with publishing experts; every section will have its own guest appearances (once I have them pinned down I'll list them here). This will be well-known industry leaders and full-time writers, many of whom I've met in person. Like I said, this course won't actually be ready until 2018, and when it launches it will cost $749. I'm only putting this page up now so that those people who buy Guerrilla Publishing this year will realize what an awesome deal they're getting. After this course launches, $749 will be the cheapest option for getting this material, and it'll be worth it. By the time it launches, I expect to be making mid-six figures a year, and I'll teach you exactly how to do the same. Save $400 and get early access by signing up now. This level includes all the courses, resources, tools and templates - as well as a full year group coaching and feedback. I'll guide you, but I won't roll up my sleeves and tell you exactly what to do (but just follow the course and you'll be fine!). Get personal feedback and editorial critiques. I'll be your personal writing coach, and help you plot, edit, format, edit and launch your book. If you're unhappy for any reason, you'll get a full refund - just ask!